We understand the allure of selling your home yourself. You might have done it before. And most of all, you don’t want to pay commission to one, much less two real estate agents. Doing a For Sale by Owner (FSBO) will theoretically save you thousands of dollars, right? And here’s where you’re probably about to check out and stop reading because you’re thinking, “I’ve heard all of this before. REALTORs are biased, and I still want to do a FSBO.” But I urge you to read on for a few more minutes and after that, if you still want to take on the challenge, no hard feelings. To unpack the issues surrounding FSBO properties, we turned to Alexis Dorgan, a Touchstone Group broker who works often with FSBOs. Q: I don’t pay someone to do my taxes. 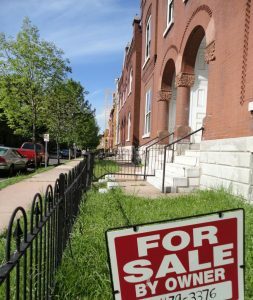 Why would I pay someone to sell my house? Alexis: Is it feasible to sell your house yourself and do a great job at it? Sure, it’s possible. But selling your home is much more complex, for a few reasons. For personal taxes, accountants will typically ask for payment to prepare your taxes up front. A real estate agent typically does not — he/she only makes money IF your house sells, and they make a percentage commission, meaning they’re incentivized to help you sell your property for the maximum amount possible. Tax law can be complex, just as real estate processes can be. But even if you make an error on your tax return or miss possible deductions to reduce your taxes, the money you’re leaving on the table is likely only hundreds or a few thousand dollars. A real estate agent will help you sell your house for top dollar, be an expert negotiator, deeply understand the housing market, and know when/where to push the buyer. Selling your property yourself and missing any of these items could mean leaving thousands or hundreds of thousands of dollars on the table. Your home is one of the biggest investments you’ll make in your lifetime. Why gamble with it? In the U.S., the average FSBO single-family home sold for $200,000, compared to $265,500 for agent-assisted home sales. Q: I’m willing to put in the work & I’ve done my research on the market on Zillow, Redfin, Trulia, etc. Why do I need an agent if I can pull comps and negotiate myself? A: Unfortunately, Zillow, Redfin, and similar sites are incredibly inaccurate. They pull their information from public data, however, a lot of this data is wrong or outdated. It typically doesn’t take into consideration any rehab that’s been done by existing (or sometimes past) homeowners, which could not only affect the value of the house due to style and cosmetic work but also due to increased bedrooms, bathrooms, or other amenities. You won’t be comparing apples to apples in your research and worse, you might not know it and underprice your home, which is the last thing you want to do. These sites are somewhat helpful as a starting point, but you can’t and shouldn’t take them at face value. A good agent will also be able to recommend where to put money into rehabbing and refreshing your property so that you get every dollar back (and more! ), based on knowledge of the local, city, and national markets, something the housing websites only understand at a surface level. Your agent should know about upcoming trends that have yet to hit the market and help you understand what will happen and how to accordingly sell your property. Q: Isn’t hiring an attorney a good enough substitute for a real estate agent? A: Attorneys are an important and necessary part of the selling process, but most attorneys have will never see your property. They don’t/won’t know if updates were made or what the market even looks like. They can’t make recommendations on how to price your property or the best way to stage or rehab it to sell quickly. Ultimately, attorneys are great for doing paperwork, getting legal matters cleared up, and pushing back on the buyer’s attorney, but at the end of the day, they don’t “know” the property or market beyond what’s on paper and what they’ve been told. Q: What about flat-fee MLS services? Doesn’t that market my property in the same way an agent would? A: Maybe in comparison to a lackadaisical agent. Paying someone or a company a flat fee to list your home on the MLS absolutely works in the sense that they’ll enter in all the required fields online and put your property on the MLS, which is the most widely used marketplace to locate properties. However, you will be required to do the rest of the legwork, such as taking your own photos of the property before listing, designing and printing your own direct mail campaign, designing/posting signs, hosting open houses, negotiating the price, preparing all the paperwork, and seeing the sale through closing. Some of these flat-fee services occasionally have other offerings such as advertising online or setting up a website for your home, but for the most part, you are on your own. Also: Potential buyers will also be able to see that you’ve used a flat fee MLS lister, and will often lower their offer to account for the savings you’re receiving on commission. Without a full-service agent, you might struggle to negotiate on price, as well as repair credits during the inspection. Q: Is this information relevant to me? I know my FSBO is better than the rest and I’m positive I’ll do a great job of marketing and selling my own home. A: You might. But do keep the following statistics in mind. FSBOs only account for 7% of all home sales in 2017. In the U.S., the average FSBO single-family home sold for $200,000, compared to $265,500 for agent-assisted home sales. In sum: There are many variables to selling your property well. At the end of the day, a listing agent is another asset in your corner that will help you get the most out of your sale and save you time, energy, and frustration. Perhaps think of the commission as a profit sharing transaction rather than paying the agent out of pocket — because as a good agent will get thousands more for your property than a FSBO owner would likely get for themselves. Questions? Comments? Or maybe you’re ready to try out an agent after months of trying your property as a FSBO. Contact Alexis Dorgan at adorgan@tsgre.com or (312) 956-3727.